I LOVE my jeep wrangler! Jeeps are notorious for running forever if you take care of them and I can attest to that! They don't make vehicles like this anymore with quality parts and very few recalls. The older models like mine are pretty basic, but that just goes to show there's less to go wrong with it. I was a little wary about having a soft top instead of a hard top, but I now think that is the best part about it. It sounds stupid, but I was worried the wind would make me look like a total disaster by the time I made it to work or wherever I was going if I took any part of the soft top out (i.e. The windows), but you can take out as little or as much as you want out or add a bikini top or other versatile tops and it made it so that I could still looked perfect when I got to where I was going. My absolute favorite car I've ever owned. I agree with everyone else that has owned one of these - I'm hooked and would buy another one in a heartbeat! I hadn't owned my wrangler very long and when I parked and was walking away from it at Costco I had some random old guy tell me that I was so lucky - his wife had always wanted a red jeep! Funny thing - I had one other person tell me that too!! AWW, warm fuzzies! I loved that I could do my own work on this easily - change oil, spark plugs, and other basic fixes. The parts were also pretty inexpensive so when the rare need to fix something did arise, it wasn't too pricey to get taken care of. I also loved how reliable it is. My husband left me alone in Colorado for months at a time during his internships when he was in school and wasn't worried a bit about my car having problems. Most of these older models don't have air conditioning - including mine. It made the soft top nice, but you need to live in an area that doesn't roast you in the summers. It also isn't big enough to fit car seats in the back seat - unless you push the front seat up all the way and have absolutely no leg room. The newer models have more leg room, so if you have kids, go with a newer year. I absolutely love Jeeps in general but especially Wranglers. To me they are essentially a giant Lego set since so many parts are customizable and easy to change in and out between stock and various aftermarket pieces. Jeeps retain their value fairly well compared to most cars and are much safer than many people believe them to be. My Jeep has treated me well over the past 5 years and I will keep it forever. I joke that the only way I am getting rid of it is if it goes up in flames, even if it was at the bottom of a lake I could pull it out and it would keep running. The only downside is there are quite a few rattles and minor fixes/ quirks that Jeeps have, you will learn the true meaning of "its a Jeep thing." Getting caught in the rain or in a complete downpour while the top is down/off is always a blast. I love that its a giant Lego building set, it is relatively inexpensive to fix/exchange parts on and it is easy to work on yourself, especially if you already have it lifted. This is the greatest truck ever made. This truck is very versatile and great looking also. It's very roomy with the two front bucket seats and generous room in the back seat, which is removable in less than a minute. This gives a huge space in the back, and you could sleep in it if you had to. The steering is tight, so you don't have that right to left action to compensate. The Wrangler has four-wheel drive "on the fly," meaning you don't have to go out in the rain to turn the lugs on the wheels. As long as you are going under 50 MPH, just pull down the lever located to the left of the drive selector, and it goes from two-wheel drive to four-wheel drive instantly. The 2.5L engine gives powerful pulling power also. I've pulled people out of the sand at the beach with little effort. It has convenient hooks in front and rear for his type of work. The inside features two front bucket seats with roomy back seat that can be removed in less than a minute. This gives a huge space that you could sleep in it if you wanted to. My truck came with a hard top when I lived in a seasonal climate, which keep it very warm in the winter and cool in summer with the A/C on. When I moved south, I took the top off and put on a "rag top" so you can easily put it down for airy comfort. The doors can be removed also, and the windshield can be folded down also. The hood fold up giving a huge space to work on the engine if necessary. It's a classic style keeping to the old Willys military Jeeps. Mine is an automatic transmission because I lived in a busy city when I bought it. I was at the beach and a guy got his truck stuck in the sand. I walked over and said, "Need some help?" He said, "No, I'm calling a tow truck." I told him I could get him out in about a minute or two (he didn't know I had a Jeep). I got my tow rope out, hooked him up and pulled him right out. He offered me $20, but I refused it. He was ecstatic! Four-wheel drive on the fly. Cold A/C. Towing ability. Tight steering. Good gas mileage for its class. Attractive. I will bounce you around more than a car or conventional truck, but it's a Jeep, and I find it fun to drive. While retaining the overall appearance of prior Jeep Wranglers, the JL features improved aerodynamics, greater fuel-efficiency and upgraded technology throughout. 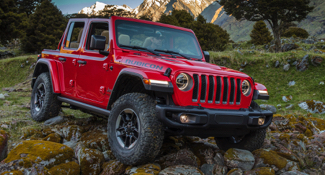 New engine options, including a turbo-charged four cylinder and a diesel version, headline the fourth generation updates to the Wrangler. The 3.6L Pentastar V6 gas engine carries over from the previous generation but it’s been revised for improved fuel economy, and a new option is the eight-speed automatic transmission. The diesel will be a 3.0-liter V6 turbodiesel. This new engine, which produces approximately 260 hp and 442 lb-ft. of torque, is the same one that's available in the Jeep Grand Cherokee (WK2) and the Dodge Ram 1500. Numerous improvements also make it easier to convert both hard and soft top versions for travel without doors or a roof, including lighter doors, a fold down windshield and storage compartments for removed parts. The JL continues to use the UConnect infotainment system, with several different touchscreen displays available and satellite radio standard on most trims. Some upgrades include retro styling that recalls earlier Wrangler and CJ models, such as the steering wheel and instrument panel. Improved side-impact airbags and strengthened pillars make the JL safer than earlier generations, as does a blind spot monitor built into the taillight housing. As with its predecessor, the JL comes in two- and four-door configurations with a variety of trim and option packages. Among the significant changes introduced with the third generation Wrangler was the introduction of a four-door Unlimited model, which provided a longer wheelbase and increased interior space for passengers. Other new features included power windows, remote entry and optional navigation. As with prior generations, soft and hard top versions were available, including both options on the four-door model. The JK was the first Wrangler designed and manufactured under the ownership of DaimlerChrysler. Several new features were also introduced with the 2009 and 2010 model years, including Hill Start Assist, which improved performance on hills; Trailer Sway Control and Electronic Stability Program, which improved towing control; and UConnect entertainment systems. Minor changes and updates continued through 2015, such as the introduction of new body colors, a new touchscreen for the UConnect system, new tire options and an eight-speaker stereo system. The JK retained prominent features of earlier Wrangler models, such as part-time four-wheel drive and a separate body and frame. A 3.8-liter EGH V6 engine was introduced as the base engine on the 2007 model and was replaced on the 2012 model by the 3.6-liter Pentastar V6 engine. Both engines came with a six-speed manual transmission, with a four-speed automatic transmission available through 2011 and a five-speed automatic transmission available starting in 2012. Numerous editions, trims and option packages were available, including the Islander, Rocky Mountain, Mountain, Moab and Overland editions. The JK was manufactured in Toledo, Ohio. The TJ was the second generation of Wrangler and it was introduced in 1996 for the 1997 model year. The most noticeable exterior change was the reintroduction of circle headlights, which were a distinctive feature of classic Jeeps. Engines available on the TJ included the 2.5 liter straight-four, the 2.4 liter PowerTech and the 4.0 liter AMC straight-six. The latter was initially paired with a three-speed automatic and five-speed manual transmission, but later in the generation offered a four-speed automatic and six-speed manual. In the latter part of the generation, the Wrangler Unlimited was introduced, which featured a wheelbase 10 inches longer than standard. This was essentially a preview of the eventual four-door Wrangler that debuted in the next generation. The TJ came in a variety of trim and option editions, including the SE, X, Golden Eagle, Apex and Sahara. In 2001 a limited 60th Anniversary Edition was released, while a 65th Anniversary Edition was released in 2006. Numerous technological advances were first introduced during the TJ's production run, including upgrading the sound system options to include first a CD player and then satellite radio. A seven speaker sound system was first introduced on higher end trim lines before becoming standard. A right-hand driving edition with an automatic transmission was produced for use by United States Postal Service employees. A minor redesign of the TJ occurred for the 2003 model year, which included substitution of a four-speed transmission for the earlier three-speed version. Other cosmetic changes included new fabric colors, transitioning parts from metal to plastic, and the introduction of rounder seats. The original Wrangler looked similar to its predecessor, the Jeep CJ-7, which was first built in 1976. Chuck Mashigan worked as the lead designer on the initial model, and YJ models were manufactured in Brampton, Ontario until 1992. For the remainder of its run, the YJ was built in Toledo, Ohio. Built for more driver comfort and wider appeal than earlier Jeep models, the YJ featured less ground clearance and improved handling compared to the CJ-7. A leaf spring suspension with trackbar suspension links, a wider base and anti-roll bars improved safety over the CJ-7. The YJ came with standard with a 2.5-liter AMC 150 straight-4 engine. Drivers could choose a 4.2-liter AMC 258 straight-6 engine through 1990. The optional engine from 1991 was the fuel-injected 4.0-liter AMC 242. Part-time 4WD came standard on all engine models. Several optional changes were introduced during the YJ's manufacturing life. In 1992, for example anti-lock brakes were introduced, and starting in 1994 a three-speed automatic transmission complemented the traditional manual transmission. Jeep offered hard and soft tops in black, white, tan and gray off and on throughout the YJ's run, with rollbar padding matching the top. Several trim and options packages were available, including the Wrangler Islander package from 1988 to 1993, which feathered bright colors, sunset graphics on the hood. The Wrangler Renegade Decor Package, available from 1991 to 1994, included upgraded wheels and tires, the 4.0-liter engine, fog lamps, a leather steering wheel and an extra fuel tank. Other trims available were the base S and SE trims, Laredo, Sport, Sahara and Rio Grande.